(Montana Free Press) A Republican-sponsored bill to extend Montana’s expanded Medicaid program was amended and then voted down on the Senate floor Thursday after five Republican co-sponsors defected in what some said was an effort to tie Medicaid expansion to passage of a “save Colstrip” bill. Even so, lawmakers of both parties say they expect the Senate to reconsider the expansion measure, House Bill 658, Friday or Saturday and ultimately pass it in some form before the Legislature adjourns.“I’m not worried, to be honest with you,” said Rep. Mary Caferro, D-Helena, who sponsored the Democratic expansion measure ultimately scuttled in favor of HB 658. 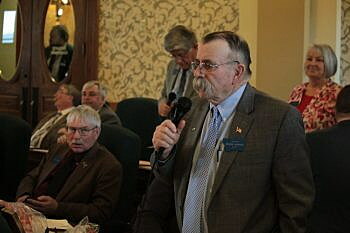 HB 658, authored by Rep. Ed Buttrey, R-Great Falls, would extend the expanded Medicaid program created with the 2015 HELP Act, which uses federal money and some state funding to provide subsidized health insurance to nearly 100,000 low-income Montanans. Unlike Caferro’s measure, HB 658 includes work requirements and other provisions designed to make renewal more palatable to fiscal conservatives who are concerned about the bill’s price tag and higher-than-expected enrollment numbers. The bill passed the House on a 61-39 vote March 30, attracting support from all 42 Democrats and 20 Republicans. In the Senate, the expansion bill was caught up in the politics around another bill, Senate Bill 331. Sponsored by Sen. Tom Richmond, R-Billings, that bill aims to help NorthWestern Energy secure a bigger stake in the Colstrip power plant. It has been criticized for undercutting the state Public Service Commission’s ability to regulate how NorthWestern passes its costs on to ratepayers. Richmond and nine other Republican senators, including prominent coal champion Sen. Duane Ankney, R-Colstrip, are listed as co-sponsors on the Medicaid expansion bill. Five of those co-sponsors — Richmond Ankney; Sen. Brian Hoven, R-Great Falls; Sen. Jeff Welborn, R-Dillon and Sen. Russ Tempel, R-Chester — voted against the expansion bill Thursday, stalling its second reading at a 25-25 vote. “It looks like some of the co-sponsors were trying to get the attention of the [the governor],” Caferro said. As the Republican-controlled Legislature enters the final weeks of the 2019 session, Medicaid expansion and another Democratic priority, a state-funded pre-kindergarten program, are seen as potential bargaining chips to pressure Gov. Steve Bullock, a Democrat, to support a revised version of the Colstrip bill. In a press briefing Wednesday, Bullock wouldn’t rule out signing SB 331 into law, particularly if it comes to his desk with amendments. “I want to see how some other issues play out, before we get too far along,” Richmond told reporters following the vote. Ankney is a self-described member of the “Solutions Caucus,” a group of moderate Republicans that has often sided with Democrats on major policy issues. “Natural resources continues to pay a big share of everything we do in this state. But yet, the other side of the aisle don’t want to support that,” Ankney said. “There were some amendments that we’re dealing with,” said Tempel, who admitted SB 331 factored into his vote against renewing Medicaid expansion. “There’s a lot of good stuff about the Medicaid bill,” he said. Reporter Leia Larsen contributed to this story. Eric Dietrich is a journalist and data designer based in Helena. He is the lead reporter on the Long Streets Project and also covers state policy for Montana Free Press, where this story originally appeared online.